We are looking upwards today at the ceiling. The chances are you’ll be looking a typically white ceiling right now. Ceilings aren’t necessarily something that we take into consideration when redecorating or redesigning our homes, which is probably why the majority of us end up using a shade of white. When you acknowledge that the ceiling is actually the fifth wall in terms of a room, it’s easier to understand why we should give it more consideration (other than painting it typically white). I’m hoping by the end of this post, you’ll agree with me that there is some fun to be had decorating your ceilings as they can really make a difference to our homes. 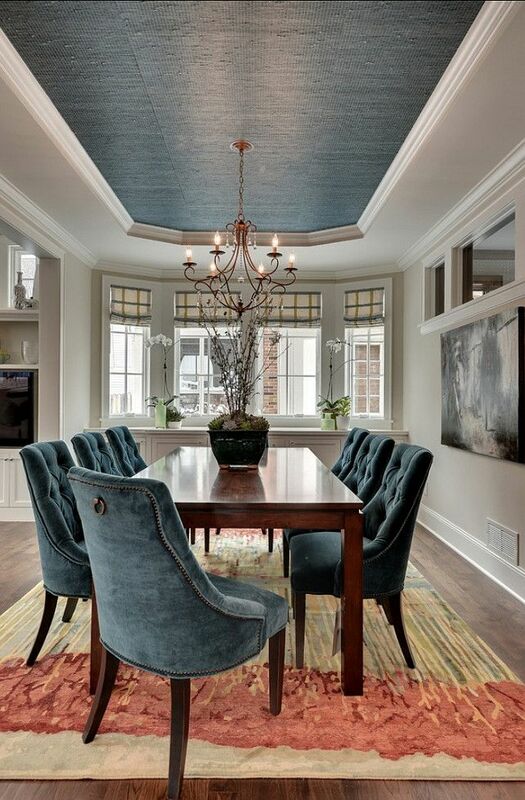 If you’re fortunate to live in a property that has architectural details, then painting the ceiling in a colour (not white), can highlight, and bring out their qualities. Or, if you’re really brave, like this contemporary space above, you could use a colourful pathway from ceiling to floor to create a central axis, which sets off the symmetry of this well-balanced living space. Some of you will have the joys of high ceilings. If they’re a little too high, or you want a more intimate feel to your rooms, choose a darker ceiling colour, and paint down to picture rail height. 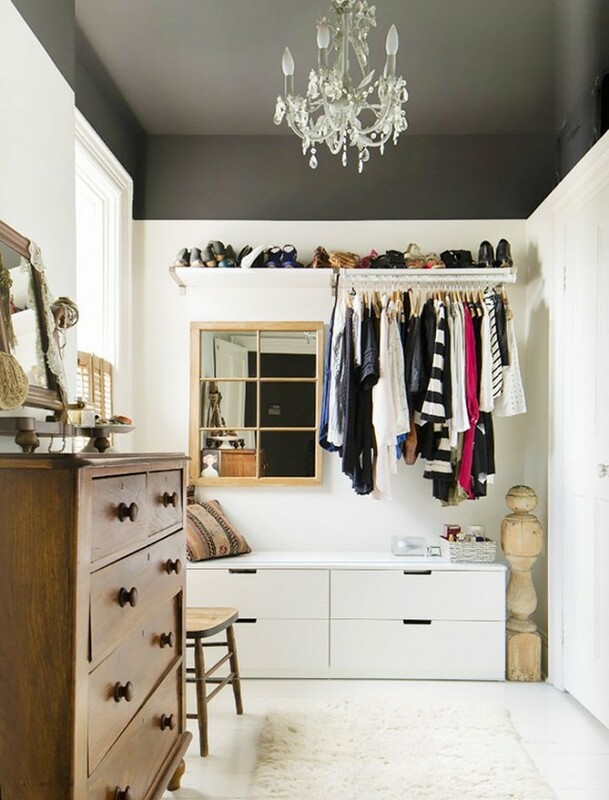 Smaller rooms with tall ceilings such as this dressing room above, benefit from this technique. It creates a much cosier feel to them. Wallpaper is so hot right now, with some amazing designs out there, but if you’ve chosen a busy wallpaper with lots of detail, you might want to tone it down. It helps create a visual balance so it’s not so overwhelming. Choose a colour from your wallpaper to use as a contrast on the ceiling. For example, if you’ve chosen one of the latest botanical prints, you could go a shade of green on the ceiling. In this fab contemporary space above, designed by Kate Davidson Design, the use of colour/black on the ceiling has also provided a wonderful backdrop to present the star of the show, the wonderful Sputnik chandelier light. There’s nothing like adding metallics to your spaces, and you may want to think of your ceilings in this instance to add more of an impact. Dining rooms are perfect for this. Whatever your choice of metallics, they add an air of grace and elegance to a room; especially if applied in smaller doses like this beautiful dining space above. Kitchens are fun areas to introduce colour to your ceilings, and the use of colour or pattern on the ceiling can also help reinforce a style to any room. 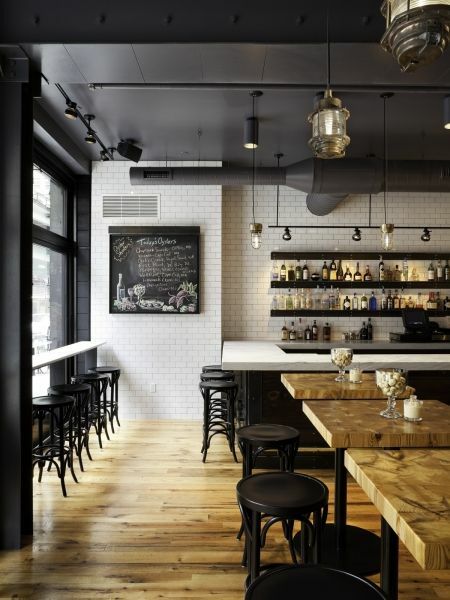 This industrial style restaurant has used this to full effect and contrast beautifully with the floor to ceiling subway tiled walls. This look could easily be recreated in a residential setting. Use your ceiling to help define zones within an open plan space. This fab monochromatic open-plan space by award-winning Australian designer James Dawson has utilised pattern on the ceiling to create a focal point to the kitchen zone. Even smaller spaces such as this office area, benefit from highlighting and creating focus on a central working point. Combine with some decorative lighting, and you’re on to a winning combination. Disguising an awkward ceiling can easily be achieved by wallpapering the ceiling and walls in the same wallpaper. This is great for any of you considering a loft extension. 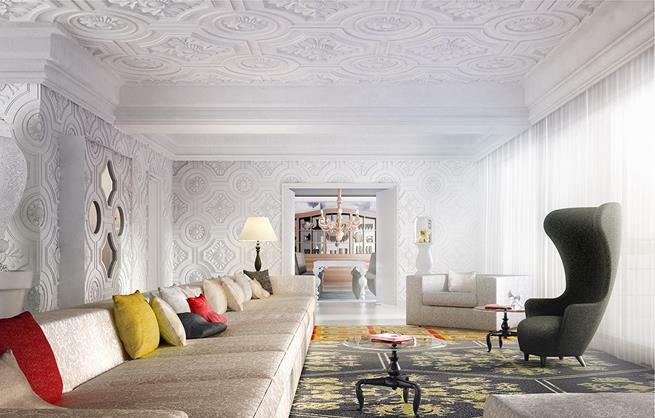 Of course, you can just choose to wallpaper the ceiling so it’s not so overwhelming. 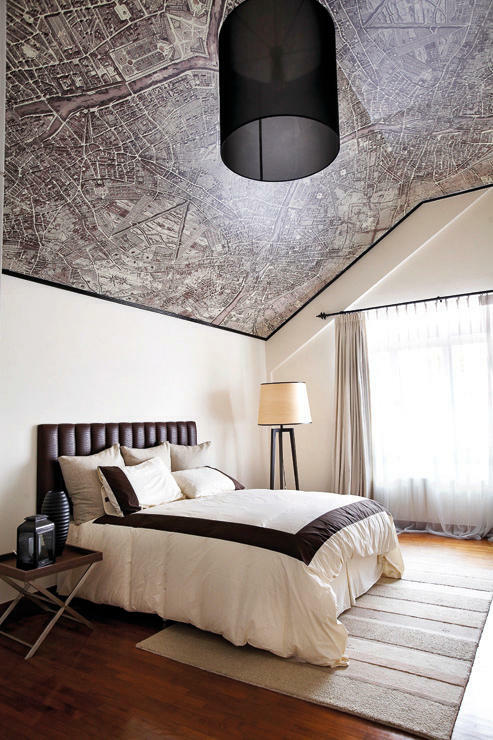 You may recall this bedroom from my Mapping It Out – Decorating Your Home With Maps post. Applying detailed wallpaper to the ceiling hides any imperfections or awkward ceiling shapes as the detail from the paper distracts the eye and blends in the angles of the room. Add interest to a neutral colour scheme by adding interest to your ceilings. 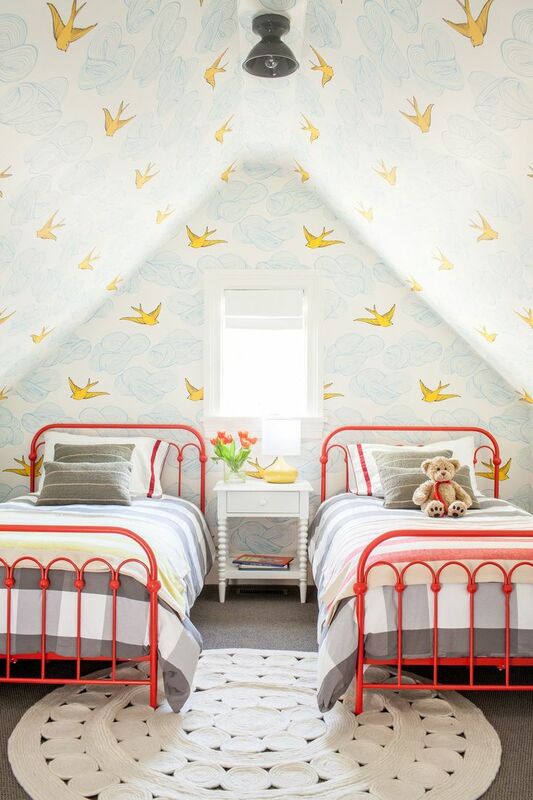 The nursery space above has used a fun striped wallpaper on its ceiling. By incorporating the ceiling as another wall within the space, you’re displaying a well thought out design. Painting the ceiling and the walls the same colour can make a room appear larger than it actually is. 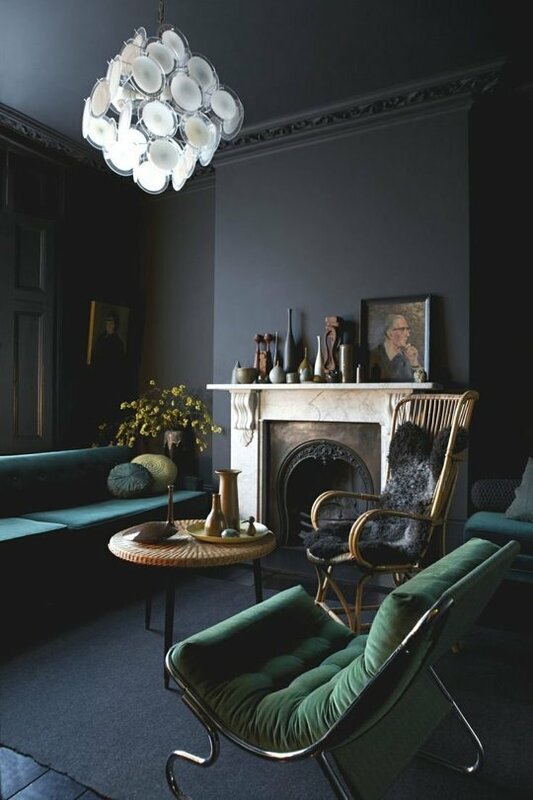 With darker colours, you can create a more intimate living space like the one above. Providing you with a visual warm blanket, cocooning you in its setting. In case you missed it, here‘s my post on Decorating in One Colour. Have a favourite standout piece of furniture or artwork you’re basing your colour scheme around, you might want to forget the walls and head on up to the ceiling. Lastly, I am going to leave you with the home of Marcel Wanders. Whilst we’re not all going to have a flamboyant home like this, I’ve included this space to show that the all-important textural element of a room doesn’t have to be left to soft furnishings, rugs or furniture, you may want to consider adding texture to your ceilings too. I’d love to hear from you so head on down to the comments box below or why not join me in my weekly ramblings and sign up so you never miss a post! Until next time, thank you, as always for stopping by.